Recognizing the upcoming annual Oaxaca celebration of Guelaguetza, a unique interpretation of Zapotec mutual support, sharing and indigenous community sustainability, I have changed the blog banner. 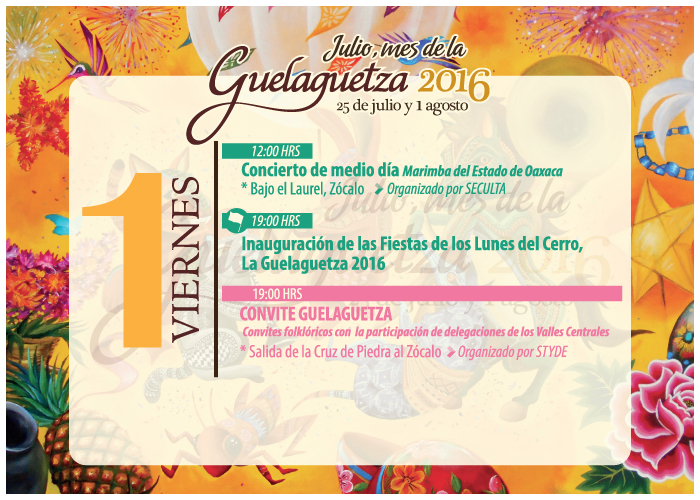 The start of Guelaguetza in Oaxaca is just a few weeks away, to be held on two Mondays, July 25 and August 1. Performances are always morning and late afternoon, twice daily for these two days. 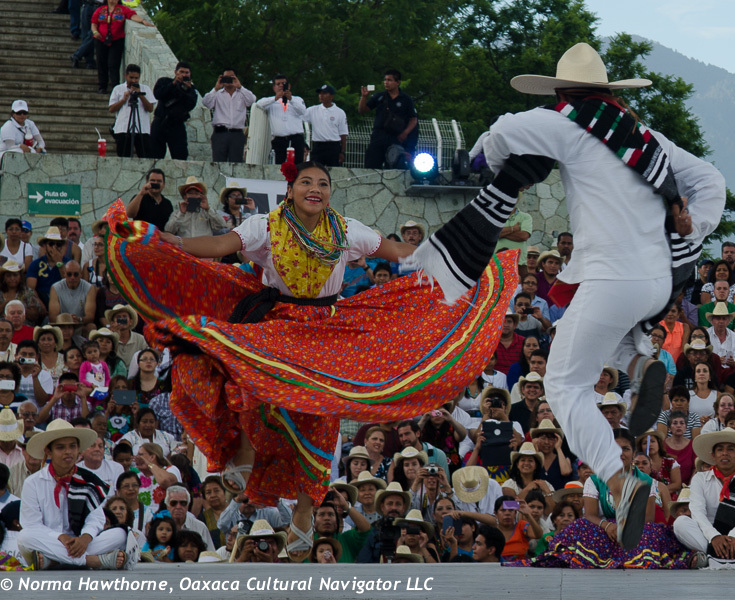 On July 2, 8, 9, starting at 7 p.m. there are planned parades to celebrate, entertain and attract tourists to Oaxaca. They start at the Piedra de la Cruz, corner of Garcia Virgil and Xoloti, at the plaza where El Quinque restaurant and 1050 Grados ceramics gallery are located. The parade route is traditionally down the Alcala tourist walking avenue, also called the Andador. The convite ends at the Zocalo. The Zocalo is now a campground for protesting teachers. With the CNTE Section 22 teacher’s union and federal government polarized in their discussions with no mediation or negotiated settlement in sight, we wonder about whether these events will be held, and if so, at what cost. The federal government says the show will go on. Like all Oaxaqueños and everyone who loves Oaxaca, we wish for a peaceful, respectful, speedy resolution. Leaps and bounds above the others, this dance sizzles. 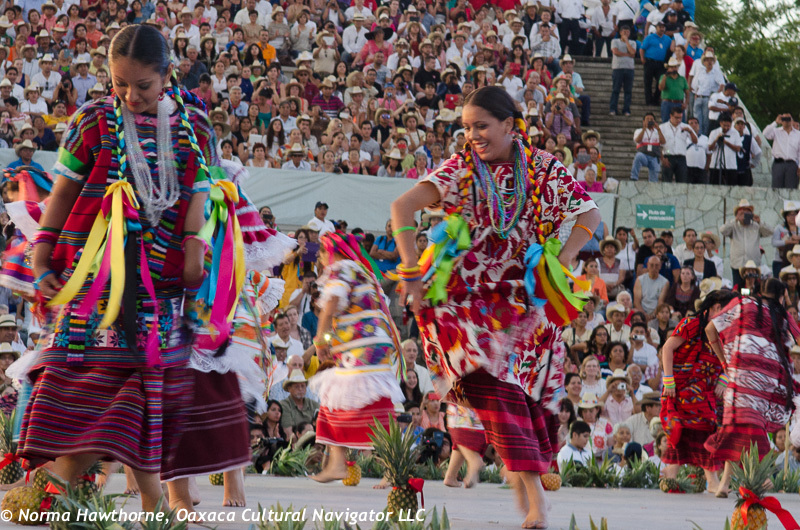 Ticket prices for the Guelaguetza are steep and not all are able to enjoy access. Yet, it is a spectacular interpretive folk art extravaganza that is a sight to behold. It is designed as a tourist attraction that has a much deeper cultural meaning and is controversial because of its exclusivity. This entry was posted in Cultural Commentary, Folk Art, Mexico, Oaxaca Mexico art and culture, Safety, Textiles, Tapestries & Weaving, Travel & Tourism and tagged blockade, CNTE Section 22, events, guelaguetza, Mexico, Oaxaca, strike, teacher's union, tourism. Bookmark the permalink. I pray that the dance will go on! Sorry to be missing out this year. Abrazos! I too hope that if the dance goes on it is because both sides have come to an agreement. It is probably symbolic of the greater issues at stake.